Can you believe we’ve been sharing our quilts this way for 5 years? I love coming together to share quilts and be inspired by all of you! I hope you take the time to share a quilt, and link up with everyone – EVERYONE IS WELCOME – no matter how long you’ve been quilting! Tell your friends, and get a post up! As the Festival continues to grow, the organization of the Festival continues to evolve. To simplify the nomination and voting processes, and keep everyone from being overwhelmed by the volume of links, there will be a linky for each category, each with it’s own post. I have conceded that each quilter may enter up to two quilts, each with it’s own post, in separate categories. Scroll down for links to each category. With each category having it’s own linky, the need to nominate a favorite quilt in each category is eliminated. Once the linky is done collecting your posts, everyone will be able to vote for a favorite in each category. Many thanks to our lovely sponsors! They have generously donated prizes for all of you to win. Be sure to stop by their shops, and find a special treat for yourself, while taking in all the quilts. They love being the suppliers for all your fabric and sewing needs! Visit the Baby Quilt category by clicking here. 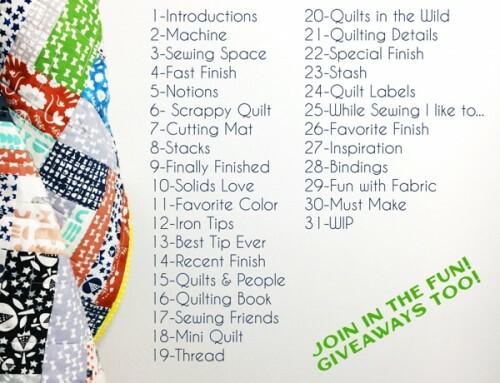 The winner of the Throw Quilt category will win a $30 Gift Certificate to Fabric Shoppe! Visit the Throw Quilt category by clicking here. The winner of Group or Bee Quilt category will win a $50 Gift Certificate to Sew Fresh Fabrics! Visit the Group/Bee Quilt category by clicking here. The winner of the Two Color Quilt category will win a $50 Gift Certificate to Pink Chalk Fabrics! Visit the Two Color Quilt category by clicking here. The winner of the ROYGBIV Quilt category will win a beautiful fat quarter pack of 20 Marblehead global brights, from Canton Village Quilt Works! Visit the ROYGBIV Quilt category by clicking here. 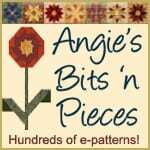 The winner of the Applique Quilt category will win a one-year membership to Angie’s Bits n Pieces and one epattern, from Angie’s Bits n Pieces! Visit the Applique Quilt category by clicking here. Visit the Hand-Quilted Quilt category by clicking here. The winner of the Home Machine Quilted Quilt category will win the first four issues of Generation Q Mag from Generation Q! Visit the Home Machine Quilted Quilt category by clicking here. The winner of the Professionally Quilted Quilt category will win a $50 Gift Certificate to 1 Choice 4 Quilting! Visit the Professionally Quilted Quilt category by clicking here. Visit the Quilt Photographer category by clicking here. The winner of the Art Quilt category will win their choice of 6 hand dyed fat quarters or Dyeing 100 Class, from Candied Fabrics! Visit the Art Quilt category by clicking here. The winner of the Doll/Mini Quilt category will win a 1 year Quilt Show Subscription from This-n-That Fabric! Visit the Doll/Mini Quilt category by clicking here. The winner of the Wall Hanging category will win a copy of Tula Pink’s City Sampler, and a collection of fat quarters from Six Munchkin Stitching! Visit the Wall Hanging category by clicking here. Visit the Scrap Quilt category by clicking here. Visit the Bed Quilt category by clicking here. 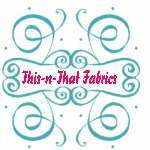 A $40 Gift Certificate to Sew Fine Fabric! A large set of Tula Pink threads from Aurifil! A copy of Beginner’s Guide to Free-Motion Quilting from Natalia Bonner at Piece N Quilt! A small set of Tula Pink threads from Aurifil! A bundle of 8 coordinating fat quarters, plus 3 patterns from Prairie Moon Quilts! A $25 Gift Certificate to Fabric Worm! A pretty 1/2 yard bundle of Pat Sloan’s My Americana Fabrics, a Aurifil thread Sampler pack, and an exclusive pair of Ear Buds for her radio show! A bundle of books from Lark Crafts, including : Doodle Stitching: Embroidery & Beyond, Pretty in Patchwork: Holidays, Quilt It With Love, and 100 Pretty Little Projects! A fat quarter bundle of Madhuri from The Quilted Fish! A $75 Gift Certificate to Sprightly Fabrics! A pattern bundle, including Russian Rubix, He Zigs She Zags, and Windspinner from Prairie Grass Patterns! 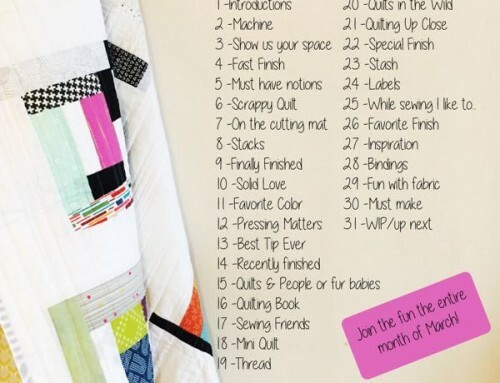 1 – Write a new post, featuring your finished quilt. Share up to two quilts, each in their own post, and the story of making them. 2 – In your post(s) link back to the Festival. 3 – Select a category and share a permalink to your post, in the corresponding linky. If you accidentally link up in the wrong category, look for the red X to delete your post, and add it to the correct category. 4 – Leave a comment on any Festival post to be entered into giveaways. Once you’ve had a chance to visit as many of the quilts, as possible you may nominate your very favorite, for a Viewer’s Choice Award! To nominate complete the form below with the link to the post and your email address. Nominations without a valid email will be eliminated, and multiple nominations with the same email will be eliminated. One entry per email address please. After nominations have been made, I will add a linky here to vote for Viewer’s Choice winners. Thanks for participating! If you have a specific problem please email me directly - I will not be able to keep up with the comments for a few days. Just finished submitting my entries. Thank you for hosting this event. I am enjoying seeing all the work. I am unsure if we can enter in more than one category. Right now I am entered in two different categories but will remove myself if that is not what I am supposed to do. THANKS. Thanks for organising such an amazing event again Amy! I’m so glad to be brwsing you festival again! So much inspiration so far and this has just started! Thank you so much for such a good job! Can you tell me how to view the quilts? I don’t see a link on the festival instruction page. Help! Love seeing all the entries and inspiring quilts! Thanks for hosting such a fun festival! Thanks Amy for putting all this together- The Bloggers Quilt Festival is such a great event!! i love the way you’ve set it up this year, and i’m sure it’ll be much easier for you as well! thank you so much for all of the work you do for this awesome event! excited to be involved and browsing again this year. you always do such an amazing job of it!! thanks…it’s good to be motivated to write about what i love doing. have a great day. Thank you as always for all your hard work. How about a ‘hand pieced’ section next time?! Thank you for hosting the festival, I love all the categories. I’m entered in the baby quilt category with my toadstool quilt. Ooh I can’t wait to see all the entries. So much talent in one place. Thanks for hosting this again, Amy, you are doing a great job. Yay it’s here again. I love the changes you made! I would like to nominate : Elephants on Parade in the Bed Quilt category. If this is not the appropriate place please let me know. The instructions seemed to point me here. Love love love the BQF! Excited to see what everyone posts! So excited again! Thanks so much for all the hard work you put in, especially getting so many sponsors! Well drat! I entered a top before I realized it had to be a completed quilt and don’t have my little X showing so I can delete it. Mea culpa! Thank you for taking the time and energy to facilitate this again Amy! Woohoo! Time to let the kids live off cereal. There’s too many quilts to look at to bother with quilting. Thank you for all your organising again! Thank you, Amy, for all of your hard work to make these festivals happen. Thanks to all of the amazing sponsors too! Thanks so much for hosting this fabulous festival once again! So much fun seeing all the entries and meeting new bloggers! Thanks for organizing the festival so well! I’m excited that we could enter two categories as this is my first time participating as a blogger. Such fun :-) I can wait to see them all! thank you so much for hosting this festival! Such a marvelous festival already!! I entered the Wall Hanging category with my Crazy Love Spiral quilt :) Thanks so much for the fun and amazing quilts!! So excited to be participating again! Can’t wait to see all the beautiful quilts. Thanks for all your hard work putting this together. Thanks again for doing this. 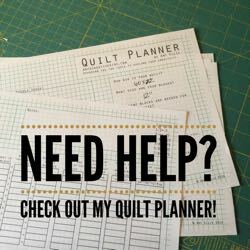 Question – can I enter into multiple categories with one quilt? Thanks again for hosting, Amy! It’s always a really wonderful event! 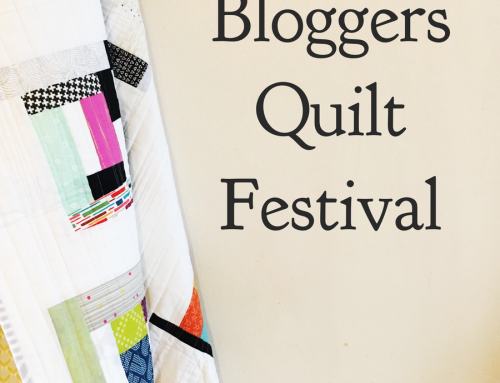 Love Blogger’s Quilt Festival! It is always so much fun! And I really like the separate posts/linkys for the individual categories! This will be my first year participating, I am a bit overwhelmed! But excited too! This is seriously one of my favorite things all year! Thank you so much for all you do to organize and run this festival! So much fun! Thank you so much for all your hard work hosting this event! Settling in with a cup of coffee and ready to browse all the great entries! Thanks for doing hosting duties again! It looks like the festival is going to be amazing! Thanks for coordinating it all for us! Thanks for all the work you do to host this festival, Amy! It’s been a couple years since I last participated, and I’m excited to able to do it again this time. Looking forward to exploring the many links! Thanks so much for all that you do! And thanks for the separate linkys this year, I think that will make things so much easier. Thanks for hosting this great event yet again, Amy. It’s always a lot of fun. Also I appreciate that you’ve divided the categories into seperate posts this year. Makes it a lot easier! Thanks for organizing this festival, Amy! I love the new layout! Thank you for organizing this event, I have watched in the past but this is my first year to participate. What a wonderful idea! I am searching for the post to add my link to. Happy to join int he Blogger’s Quilt Festival fun again this year. THANKS! Found it! I’m in the Scrap Quilt Category! 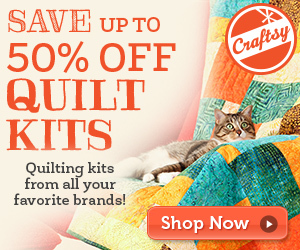 Thanks again for everything you do for us Quilt Bloggers! 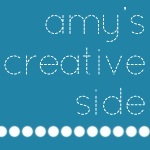 Hello again….this is so much fun Amy; thank you for hosting . I can’t find a linky; so I am hoping this is all you need. If not; please let me know so I can enter my quilts. So excited to actually have something to enter this spring! I love the new format and hope it will be much easier for you. Thanks so much for hosting this for all of us! I forgot to mention that I have two quilts entered….one in the bed quilt category and one in the group quilts. Thanks for hosting Blogger’s Quilt Festival, this is my first time. Amy: Thank you for being our wonderful hostess and for giving all of us quilters this opportunity to share with each other. I look forward to this event all year. Thank you for great event. I enjoy going through the beautiful creations others made. Amazing job in organizing and putting together all the sponsors for the festival. Being able to participate is such fun and inspiring. Hugs and thanks for all you have done. Awesome! Thanks for organizing this!! Thank you so much for all of your hard work getting the posts ready separating the categories makes things so easy this time! And thanks to the sponsors for all of the wonderful prizes! Hi, love this event! I put my quilt in throw quilt but can I enter it in home machine quilted? I don’t think so but I will ask and then it enters me in the giveaway! Your awesome! 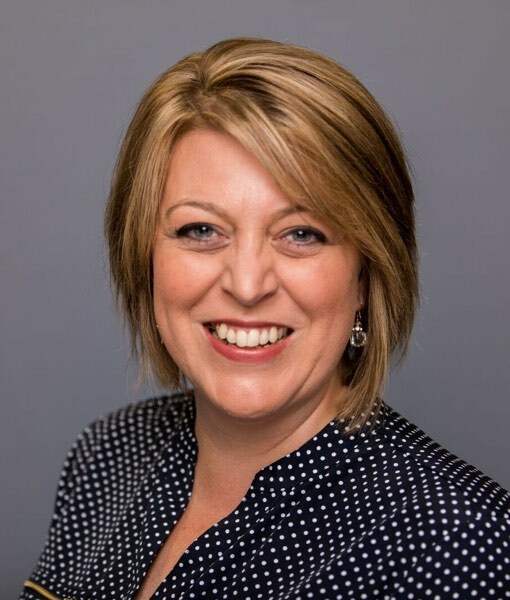 Thanks so much for all of your hard work, Amy! Excited to be entering my fourth Festival! Thanks so much for the work you do to organize this! It’s my 4th time participating and I really enjoy seeing the online community come together. Wow! So many quilts already and it is only the first day! I am going to be very busy for quite awhile. Thank you Amy for hosting this wonderful event! Thank you Amy! You are the best! This is one of my favorite parts of the year! I love the new set up! It’s going to make voting so much easier. 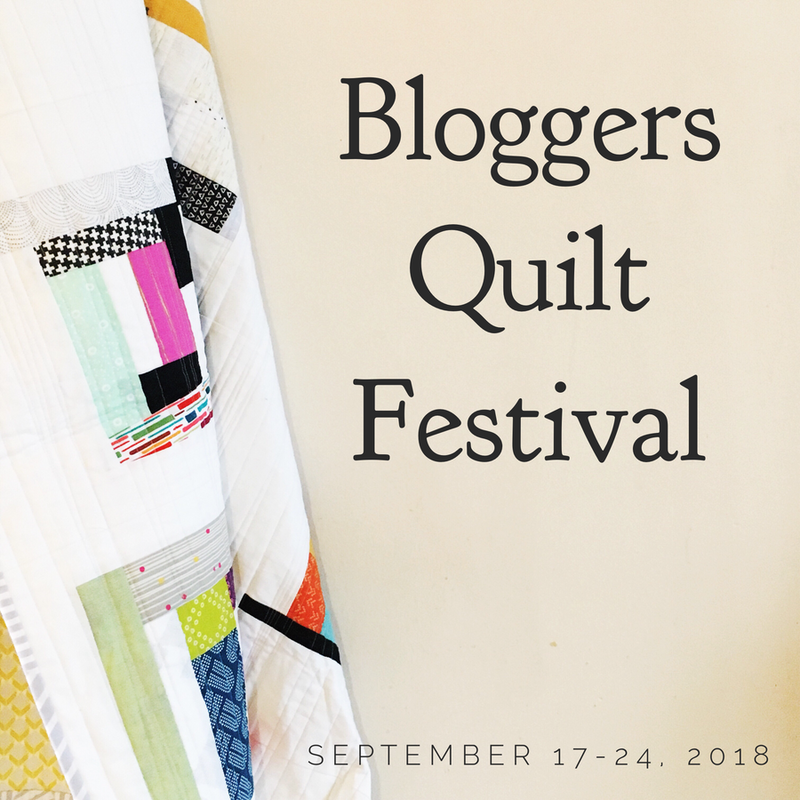 Thank you for a new Blogger’s quilt festival. Every year I enjoy participating on in and meeting lots of new bloggers. Thanks for hosting! Love to see what everyone is quilting! I am so excited to enter this again. Thank you so much for hosting! You are awesome!! Thank you Amy for doing this again. I like the way you have it set up this year. thanks again for all your hard work. Thank you so much for all your work hosting this event. Such wonderful inspiration from all the entries! Ive entered! Happy to be here! enjoyu seeing all the quilts. Had trouble finding this page. There is no ink to it on the mail page. I am so excited! Can’t wait to spend the next week of my life looking at everybody’s handiwork! Let the games begin! I LOVE the idea of separate posts/linkys for each category, it definitely will make it much easier to vote! Thanks for all your hard work! Looking forward to checking out all the quilt lovelies and voting! Good on you for doing this! Amy, thanks for all the work you do to set up this amazing showing of quilts. I can’t wait to see this spring’s collections of beauty! I’m so glad to have two quilts to share this year. I really like how you’ve organized the festival with a separate post for each category. Thanks for all the work you do hosting this on-line quilt festival. Thanks for all your hard work! I’m so glad I get to enter this year! I entered for the first time and put my quilt in the applique category. Thanks so much for having the Festival–I’m going to be super busy visiting all the links! Thanks for having this awesome quilt festival, Amy. 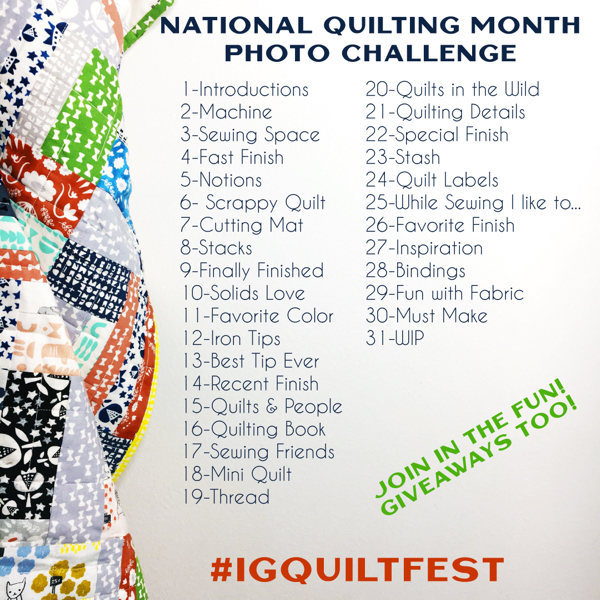 This is my 2nd time participating, and I love seeing all the beautiful and inspiring quilts! Love looking at all the amazing quilts! I’m sure there is so much work that goes into this – and really appreciate you doing it. Such inspiration for us out there! Grazie per questa nuova splendida opportunità! Thank you for doing all this! It is so much fun to see all the quilts! First time entering and so happy to be apart of it. Thanks for all your hard work on this, Amy. I’m inspired anew every year! as always, Amy, you are a rock star. Thanks for organizing this every quilt market. Definitely loving the new setup this time! Thanks again for organizing and hosting! I can’t believe its Festival Time already! Awesome work Amy. I’m excited to enter my latest quilt design for the Blogger’s Quilt Festival in the Bed Quilt category. Hopefully I’ll get my post together to enter another quilt too. Thanks for doing this each year! Thank you Amy for all the work you do on the festival. I love to see the quilts, it is so inspiring. I have added my entry too. I’m so excited to participate this weekend! I have wanted to for years, but this is my first opportunity and I know it won’t be my last! Thanks for all of your hard work! Thank you Amy for all you hard work organizing this amazing event and for letting me be a part of this. It’s wonderful to see everyone’s beautiful creations. Thanks for organizing, hosting, monitoring etc., etc., etc., ALL of this once AGAIN. I love entering and looking at all of the fabulous quilts!!!! So many gorgeous quilts in the festival this time! What an exciting Festival. I’m off to find photos of my quilt so I can enter too. i’m new to this festival and i think it is totally awesome. thanks for hosting it! Thanks for the the festival again! Looking forward to seeing all the inspiration! Thanks for putting this festival on! I love seeing all the lovely quilts and the way you have it set up this year sort of makes it a bit easier to view all. I can take a category at a time. All of your hard work is so appreciated! You Rock, Amy! Thank you for organizing this inspiring event, Amy! I am so excited to be participating again! Thank you again for such a terrific job in organizing this yrs Spring Quilt Festival.. Oh, so many entrants and lots of beautiful eye-candy!! It is going to be very hard to chose a favorite. So many great quilts out there! Very excited to be participating for the first time! Great festival as always – loads of categories and super inspiration! Always fun to be a part of this great event! Thank you SO so much to Amy and all the sponsors and anyone else who helps put this all together! This is such a fun event! And to all the participating bloggy quilters, Well done!!!!! I like to join this festival. Thank you for organising this. It’s the first time I do a thing like this. Thank you so much for hosting the Quilt Festival again Amy. Also, many thanks to the sponsors! Thank you so much Amy for all of your hard work, organizing this wonderful festival. And a big thank you to your sponsors! Love all the new changes! So much easier to see whats in each category! I just found the Blogger’s Quilt Festival this last week (to be fair I’m still a fairly new quilter, though clearly bad at internetting!). It’s so much fun! I’ve entered two quilts and can’t wait to get visiting everyone else :) Thanks so much for organising all of this!! Amy thanks for hosting this event. It’s my first time entering but I voted last year. So excited to be a part of the festival for the first time! Everyone is so amazingly talented. Looking forward to checking out all of the lovely quilts! Such a fun event! I am linking up for the first time and am looking forward to browsing everything. Thank you so much for hosting! What delightful fun to see other folk’s accomplishments. Thank you SO much for organizing this twice a year. So much inspiration. I was wondering what the difference is between the Doll Quilt and Wall-hanging category? Now I’m second-guessing which category I chose! Thank you so much for organizing this event for us! It is always very inspiring to see all the great work. Thanks for organizing such an amazing event! I love seeing what everyone has made and find inspiration at every link! This is going to be fun! Thanks for hosting this. I am new to quilting and am inspired seeing others’ talent in their completed quilts. My creativity is finally unleashed after years of being stifled by career and life demands. In the time I have left on this earth, my goal is to leave a legacy of riotous color scattered everywhere! This is so exciting!! I just came across this today and can’t wait to look at all the eye candy. I am a newbie quilter and love all of the inspiration the Internet has! Thank you so much for hosting this event again. It really is a great way to go to an international quilt show without having to leave the comfort of one’s own home! Thanks so much for hosting this, I live in a small town and no local quilt show so this is the next best thing! Thank you for hosting this “show”. It’s very interesting. I’m excited to see how it goes! Is one quilt allowed in two different categories? Thanks again! Thank You so Much!! I can’t wait until all the quilts are up to check them all out :) Thank you again for hosting! I can’t believe all the wonderful quilts in the festival. It’s going to take me days to go through and see everyone’s quilts! So much amazing talent! I always look forward to the Festival because I always find great new blogs to follow! Now that my entry is done, I can start perusing all the categories (a great innovation btw), see all the great entries and start deciding on my favorites! It’s inspiring how much you’ve accomplished with this and I’m glad that you are able to continue hosting this for us. Thank you, thank you, thank you!!! Thanks so much for all your hard work to host this. I look forward to it each time. Thanks so much for all your hard work in coordinating this awesome event Amy. I just love looking at everyone’s quilts and creativity. This makes me want to start a blog in order to share! Thanks for setting this up, there’s so much eye candy! Thanks so much for hosting the festival Amy – it is always so inspiring to see so many lovely quilts! Thanks for organizing it again..
thank you for all your work with the Festival! I think it is a good idea to separate the entries in different categories. There are already so many wonderful quilts that it will be hard to choose the favourites! i can’t believe i’ve missed 4 years of the festival! so excited to participate this year! Thanks so much for hosting and organizing this festival. There is awesome and awe-inspiring work on display. This is so much fun! Thank you Amy for hosting this year after year. I just stumbled across this website a few days ago. I am so glad I did! There are so many creative and talented people here. I love it. I added it to my reading list right away. I’m so confused as to how to nominate our favourite quilt LOL I have to copy and paste a link, but where do I submit the form? On this page or the page that I started at? LOL Love the festival! Thanks so much for hosting again! Gemma did you figure out how to post? I’m trying to find the entry point to start submitting and can’t figure it out. Thanks so much for any assistance!! I’m excited to participate. Thanks Amy for all your hard work, I am enjoying the festival alot. Thanks a lot Amy for this great event! I plucked up the courage to enter one of my quilts. It’s a bit scary seeing all the fantastic quilts out there! Thanks for organising the online show. How many hours am I going to spend gazing at quilts!!?? Thanks Amy for putting this together! Always fun to see all the lovely quilts! This is so inspiring!!! I love seeing everybody’s quilts in one place:-) Thanks for organizing again, you’re awesome!!! So very excited to have entered two of my quilts! This is the first show I have entered. I entered Diamond Daze in Baby Quilts, and To The Rescue in Wall Quilts. Thanks! Amazing prizes and chances to show off our skills! I tried to enter but I cannot figure out how to include a backlink on my blog… Poo! Thanks so much for your time and efforts to organize such an event. There are some gorgeous quilts. Thank you for hosting the amazing event again, Amy. Thanks for hosting this quilt festival! I always enjoy seeing all the beautiful quilts. I’m so excited to be participating this year! Thank you so much for putting this on, I just entered my first quilt, so fun looking at all of the quilts and finding new blogs. thank you again!!! lots of fun! Thank you for all the work you put into the festival! I’m so excited to share a quilt as part of this! Many thanks for all your hard work and vision to make this amazing festival happen. What a fabulous experience and wonderful way to become aware of other quilters and what they are creating! This is fun! Thanks so much for putting this together!! I’m despreately looking for the linky to be able to post my quilt in at the last minute. However: thank you for a marvellous digital quilt festival! Thanks for another great festival and what a great idea of breaking down the categories. I have had the most fun going through all these amazing quilts. Thanks so much for holding this event. Seeing all the entries is so exciting. This is such a talented group. Thanks for organizing. I love looking at all the quilts – you can really see what the trends are in quilting and what everyone likes to do. Thanks again! Thanks Amy ! This is a great thing you do for us ! Blessings ! I’m so glad to be here. It is the first time when I participate on Blogger’s Quilt Festival. Thanks for another wonderful Festival Amy!! It was really difficult when it came to voting too. We have a lot of very talented people blogging with us. We are very lucky to have so much great inspiration. I just love Blogger’s Quilt Festival. Thank you so much for always hosting this wonderful event!! Wow what a Festival – so many great quilts!!! Well done everyone! Thanks again for taking the time and effort to organize and promote this fantastic virtual quilt show. I love looking at all the quilts. It is so inpiring. Once again I have come away with so many ideas and beautiful images that I could never put them all into action. Thank you for hosting! I love to see what everyone is working on! I had so much fun… some tough deciding because there are so many creative and talented people who have entered gorgeous quilts! Thanks Amy for hosting this wonderful event!! What a wonderful idea. Thanks for hosting this event. I’m having difficulty putting my arms around how this bloggers quilt festival works, and how to vote. Perhaps tomorrow can work on it again. There is so much inspiration for creativity shown that I get carried away looking rather than voting. Thank you for sharing all this amazing talent out there. So much eye candy and wonderful inspiration. Thanks so much for hosting this event. The organization this season is exceptional. It is so fun to go to a Quilt Festival without leaving my house! 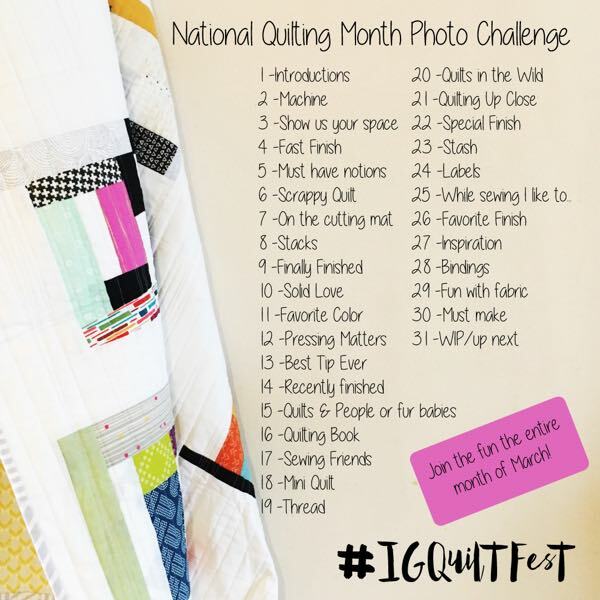 This is such a great idea, I have really enjoyed looking at the posts and deciding which quilt to vote for, some amazing talented quilters! Thanks so much for hosting this again! So glad to be able to enter my quilts and see all of the others! So hard to choose just one to win Viewer’s Choice! All of the quilts are so lovely and required so much work and talent, it is unbelievable. I did, somehow, choose one. Thanks for hosting the Blogger’s Quilt Festival! Thanks Amy for hosting this. It has been amazing to visit so many blogs and to see such amazing quilts. I love the festival! Thanks! Thanks for puttnig all the hard work to host this great event! I look forward to this every year. In the middle of voting. So many beautiful works of art by so many talented people. Thanks for organizing this wonderful show. It’s so much fun to see so many great quilts! Thanks for creating this virtual show! Thank you so much for this fantastic event. Thanks Amy for hosting this wonderful event! Very talented people, beautiful quilts! Amy thank you so much for hosting this amazing festival again. While I’m not new to the festival it is the first time I have linked up and participated. Thank you so much for the chance to do so. Another fabulous festival. Thanks so much Amy. Fantastic festival, Amy! Thank you very much for organizing it — it was wonderful inspiration! Another totally amazing quilt festival! Thank you for hosting these lovely events! I’m hoping I will have a little calm in the sea so I can post for your next wonderful festival event. Thank you, so much, Amy. What another wonderful success! I think the new layout is a great way to compare apples to apples and keep up with what you have already looked at! Seems as if people participated? Wonderful inspiration nonetheless! It seems that youre doing any unique trick. exactly the right info that I was looking for! .